Tim and I were married in a hot air balloon in Las Vegas in 2002. Well, a grounded hot air balloon. The weather was too windy to even safely inflate the balloon for our wedding photos. Despite scheduling hot air balloon rides everywhere from Las Vegas to Egypt, something always kept us grounded. After an 11 year wait, our first balloon flight needed to be nothing short of spectacular. 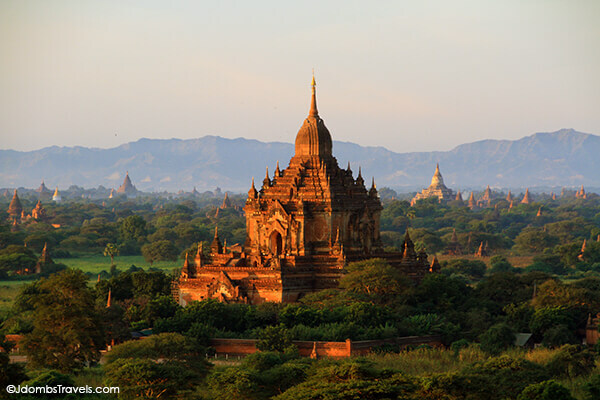 So we booked a flight with Balloons Over Bagan, in the ancient city of 4446 pagodas, and crossed our fingers for good weather. After all, traveling to Myanmar, even from Thailand, requires endless hours, at least two flights, visas, and promises to never write about the regime there. We arrived to Bagan after dark and climbed into a taxi to our hotel on the edge of Old Bagan. We spotted a few of the stupas close to the dusty road, but our first glimpse of the other worldly ancient city would be from a wicker basket as we floated above the temples. I’ve never been so excited for a 3:30am wake-up call in my life. Balloons Over Bagan promptly picked us up from our hotel at 5am and delivered us to the launch field to enjoy coffee, tea, and cookies before our flights. Tim and I were incredibly impressed with the organization. There were a dozen or so balloons and each had its own little area set up with camp chairs and the coffee and tea station. This kept the groups organized so as soon as the balloons were inflated, our group could pile in and float wherever the wind would take us. As the sun hinted it was ready to peek over the horizon, our group clambered in and we gently floated off the ground. We got our first birds-eye view of the Buddhist temples seemingly rising up out of the mist. This was just so much more incredible than we had even imagined! The temples were set ablaze by the golden rays of the sun. 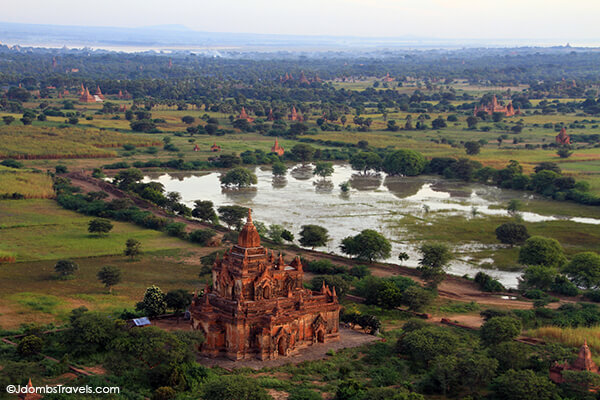 Our pilot Ian, who has been piloting Balloons Over Bagan since 2005, pointed out temples and told us stories about them. We were in such awe, we’d never remember it all. So, just enjoy these photos of our amazing experience! We’ll have more detail about the temples we visited in another post coming soon. We floated for around an hour above the temples before landing with champagne, croissants, and banana cake waiting for us. As Tim and I clinked glasses, he admitted he was worried that we were spending so much time traveling to Bagan and that it would be disappointing. It was barely 8am and any concerns he’d had were completely squashed. 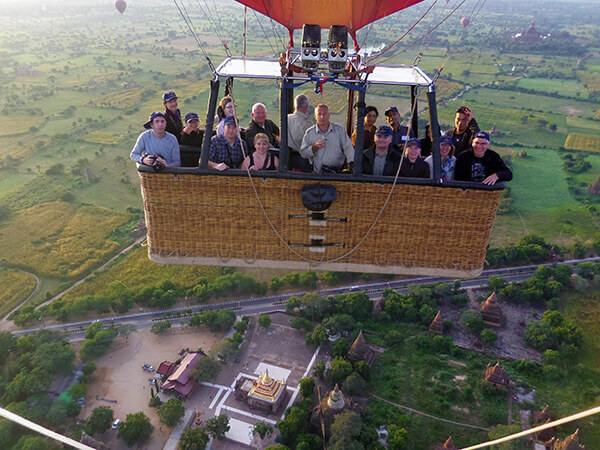 We couldn’t wait to start exploring the temples and we couldn’t have had a better introduction to Bagan than from in a balloon floating over it. Balloons Over Bagan is the only balloon company in Bagan. Balloon flights are available October – March. All the balloons are equipped with a camera and you have the option to purchase a thumb drive of the photos from your flight for $15US. The thumb drive is delivered to your hotel by lunchtime. What a great service! 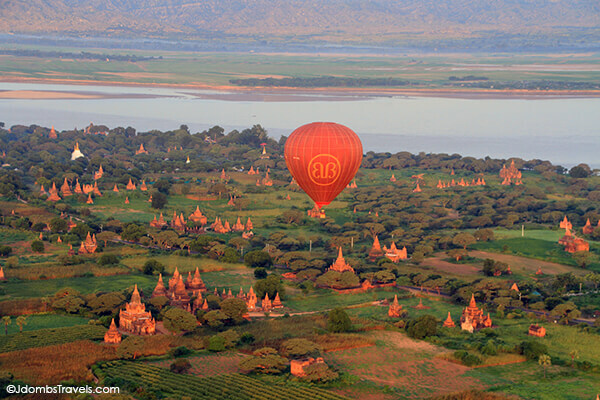 Balloons Over Bagan will only fly children that are at least 8 years of age and are at least 4’6″ tall (137cm). This is both for safety and the height required for the child to see over the basket. 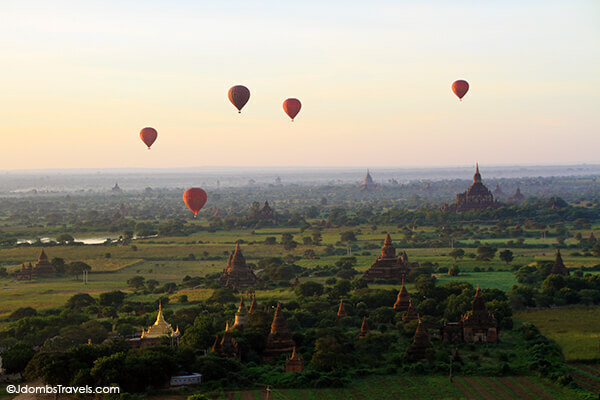 We received a discounted media rate for our balloon flight from Balloons Over Bagan in order for us to bring this story to you. As always, all opinions and rave reviews are entirely our own. And a huge thank you to Balloons Over Bagan for making our first hot air balloon flight together such an amazing experience! Your hot air balloon ride looks awesome! We flew over Cappadocia’s “fairy chimneys” in Turkey, and that was pretty special. Bagan looks it could rival Cappadocia :-). I’ve got a bucket list of places we’d like to balloon and Cappadoccia is on it. We just didn’t want that to be the first place we finally ballooned because it seems everyone is ballooning there these days. 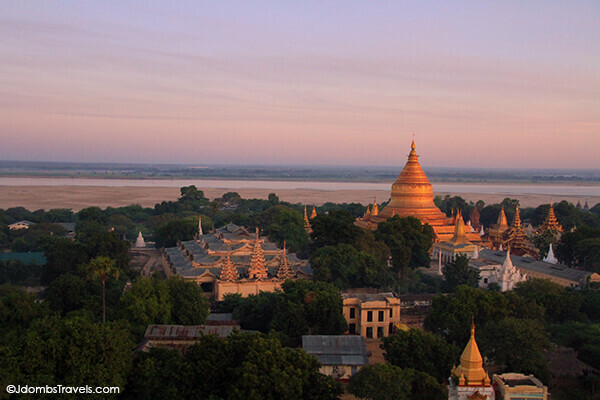 It’s going to be pretty hard to top Bagan though! Right Liz?! Let’s hope it’s not another 11 years before our next balloon flight! Wow! That looks like a spectacular journey. I’m so glad that you guys had some nice weather for your balloon ride. From a distance, the temples remind me of the fairy chimneys in Cappadocia. The weather couldn’t have been better. I think we’re going to need to balloon in Cappadoccia and compare! You’re the third one to tell us we should balloon there. Holy cow, that looks AMAZING! I love the colors and contrasts. It was! You’d love it, Amanda! Wow- amazing shots! Simply stunning! This is totally on my list now! 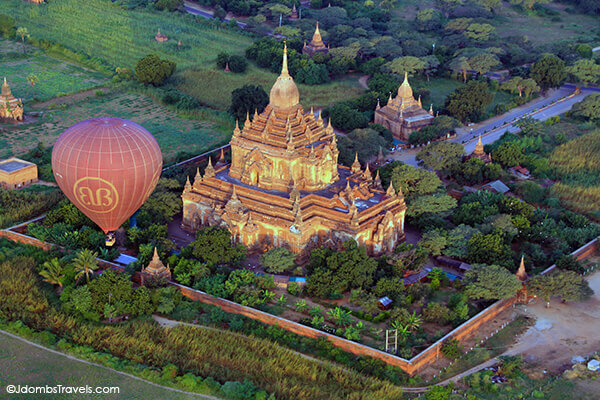 Never been ballooning, but I think I’ll have to go in Bagan! Tim gets all the credit for the photos! I just watched and took it all in. I have been ballooning in Napa and now Bagan. I’m hooked! It’s so peaceful and a fantastic way to see such sights. Bagan was nothing short of spectacular. So beautiful!! I wish they offered that tour in April, since that’s when I’m trying to go. Just gives me another to have to go back a second time I guess! April starts the rainy season in Bagan so they can’t fly. Too bad because I think ballooning there should be at the top of everyone’s bucket list! South Africa sounds like another amazing location to hot air balloon! How beautiful!! Very cool experience. It was definitely a very cool experience! I think I’m hooked. Now I’m just thinking about where to hot air balloon next! Oh those views are so breathtaking, I did a balloon flight in Capadoccia in Turkey last month, the first in my life and it was such a great experience! 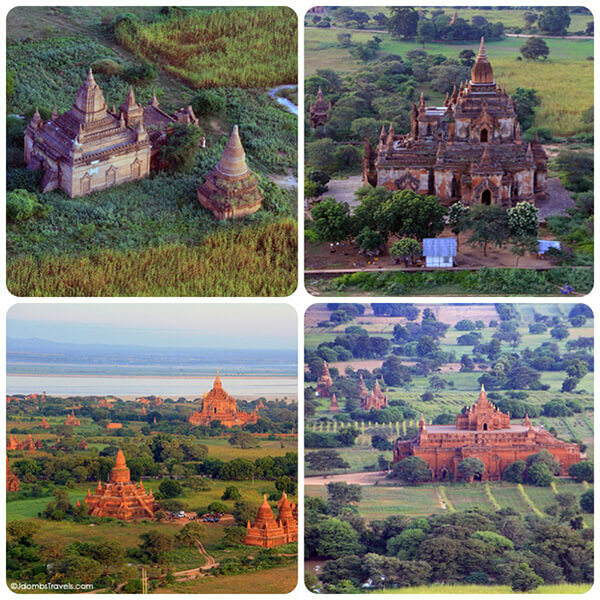 When I saw your photos I promised myself that I have to do again in Bagan! This looks absolutely amazingly beautiful! Well done on getting so many amazing shots. I’d have been gripping the side too hard to hold my camera steady! After all the crazy things you did despite your fear of heights in New Zealand, I would bet that you would absolute love ballooning! I’m really not so sure! I think I’d freak out! I’m still scared of heights, and a balloon ride would last a lot longer than a bungy. I know it sounds mental after some of the things I’ve done, but I really think I would be a nervous wreck in a balloon! One day, I plan to find out! I hear there are some pretty amazing places to balloon in Australia! 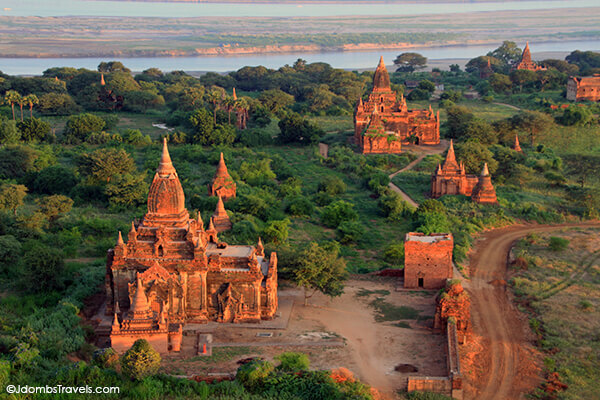 What a fantastic way to see Bagan and your photos really do the area justice. Hard to believe it’s all over by 8am. I have been ballooning just once – in Ouray, Colorado and I couldn’t get over how quiet it was. Congrats to finally making it up in a balloon. Thanks Leigh! It is incredibly quiet and so peaceful. Balloon pilots have an awesome job! Is it totally greedy that now we think once wasn’t enough? 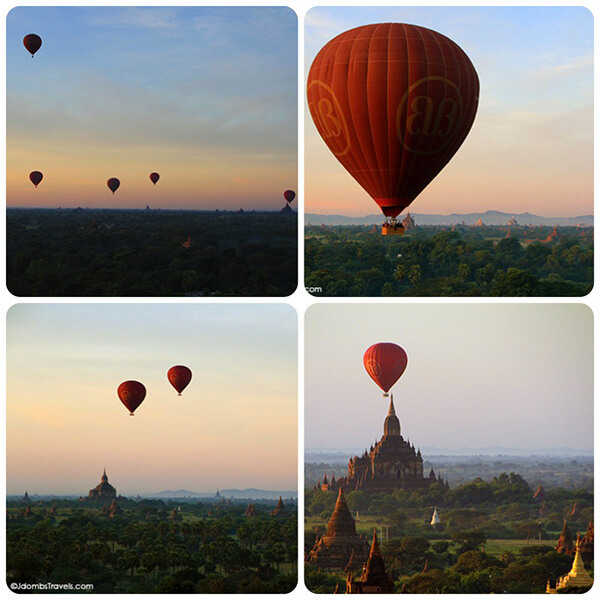 It was such a great way to see Bagan and now we want to hot air balloon everywhere! Wow that is gorgeous. Must have been an amazing experience! It really was, Ellen! Have you ever been ballooning? I haven’t. It looks amazing but I think I would be terrified! The long, long wait turned out to be worth it to balloon somewhere so spectacular! 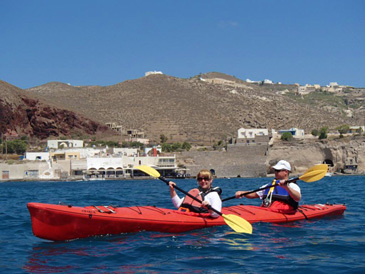 What a fantastic way to take in all that beautiful landscape. We’ve always wanted to take a hot air balloon ride, need to do it soon. You and Lauren definitely should! You guys would love it! That looks amazing! 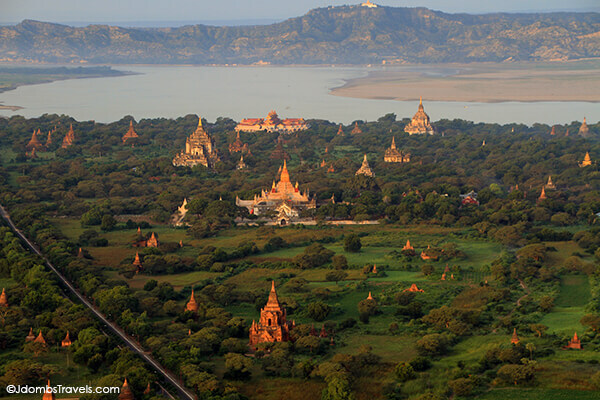 What a great way to explore Bagan! It really was, Stef! We got a birds-eye view of the temples we wanted to visit and could get an idea of the layout so it was actually great for easily navigating around later in the day. Sounds like such an amazing time, experiencing those views in person must of been awesome! Breathtaking photos! It kills me that we didn’t make it to Myanmar during our time in Asia, but this just gives me something to look for to for next time. Simply amazing!! This has one of the things I’ve been dreaming about. I really really wish to go. This is just amazing. I went, and thought it was worth the splurge! 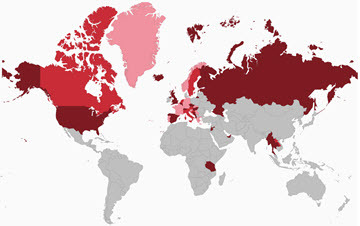 However, I think there are other places in the world where it’s much less costly for a hot air balloon ride. Thanks for sharing so many photos!